So what are Free Sugars? We used to only think sugar was bad in terms of tooth decay. However, we now know high intakes of sugar are associated with obesity and increased risk of the development of metabolic disorders such as type 2 diabetes. Sugar is very quickly becoming the enemy, even to the extent that the idea of ‘sugar addiction’ is becoming an increasing worry to many, and although these ‘addictions’ might be a bit farfetched, as a nation we are consuming far too much of the sweet stuff and should put more focus on limiting our intakes. Public guidelines suggest no more than 5% of our total energy requirements are to come from 'Free sugars', so for an individual who requires 2000 calories a day this is equal to 25g of free sugars (about 6 teaspoons worth), but it's worth remembering this figure will change between individuals dependent on their stature, lifestyle, current health status and health history. So what is included within this term? 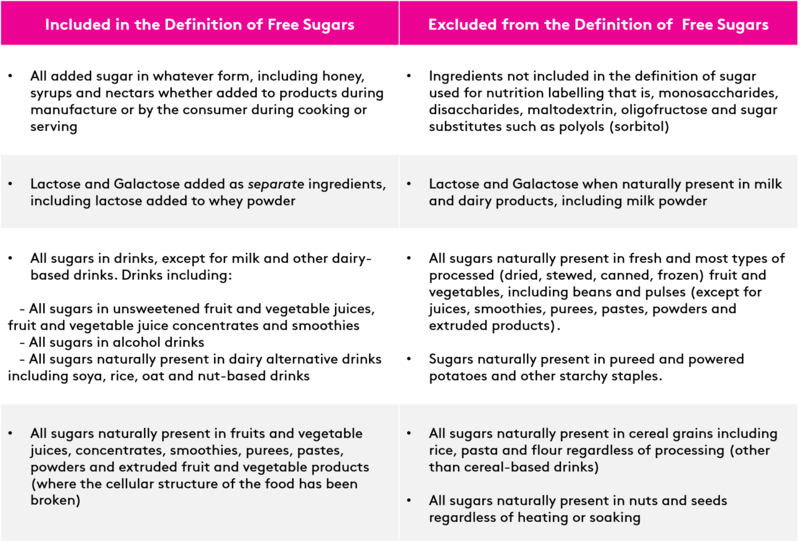 The term 'free sugars' is an updated term for NMES (Non-Milk Extrinsic Sugars) an old definition used by health professionals to distinguish between different types of sugars available in our foods. Free sugars include all added sugars as part of it's definition so what are added sugars? Added sugars are "sugars and syrups that are added to foods or beverages when they are processed or prepared. This does not include naturally occurring sugars in foods such as milk and fruits." Free sugars include "all added sugars in any form and all natural sugars that have been released from the cellular structure of the food such as those present in fruit and vegetable juices, purees, pastes and similar products. All sugars found in drinks (except for dairy-based milks) and lactose and galactose when added as ingredients". 👉 So to summarise, if the sugar is freely available and not bound within the complex cellular structure of the food product it belongs to (which will significantly decrease the rate of absorption in our bodies) it can be considered a 'Free Sugar'. Why does it matter if the sugar is 'free'? If the sugar is 'free', it is digested and absorbed at a much faster rate. This will spike our blood glucose and we know that apart from interfering with our energy levels, these spikes of glucose within our blood over a longer period of time can lead to resistance in the maintenance of sugar metabolism which leads to type 2 diabetes. Not only that, but often these free sugars are much easier for us to eat. 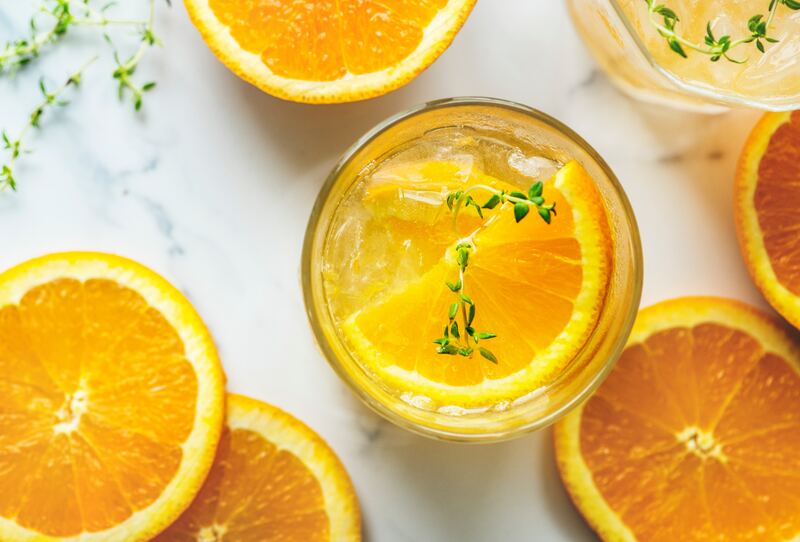 Take a glass of orange juice for example, you could drink 250ml within half a minute, but how long would it take you to eat 4 oranges in contrast? This leads onto another important point, when sugars become 'free' and are released from their cellular structure the same process often removes much of the very useful fibre. We know that in the UK we are consuming half the amount of fibre we should be aiming for (around 30g/day), but are consuming nearly double of free sugars we should be. Maybe swapping that glass of orange juice for a real orange will be a start to get us back on track. Did you know that simply increasing your fibre intake by just 7g a day significantly decreases your risk for heart disease and colorectal cancer and that improving overall fibre intake can assist with reducing blood pressure readings and LDL cholesterol levels? So should we avoid foods containing Free Sugars? No, the purpose of this article is to educate, not scare. Whilst we should all be doing our best to reduce the total amount of free sugars we consume, we should not exclude whole groups of foods. Some which fall into the category of 'containing free sugars' provide many useful nutrients that are very beneficial for us to have as part of a balanced diet. Whilst other foods may fall into the category, but are actually very low in sugars anyway. 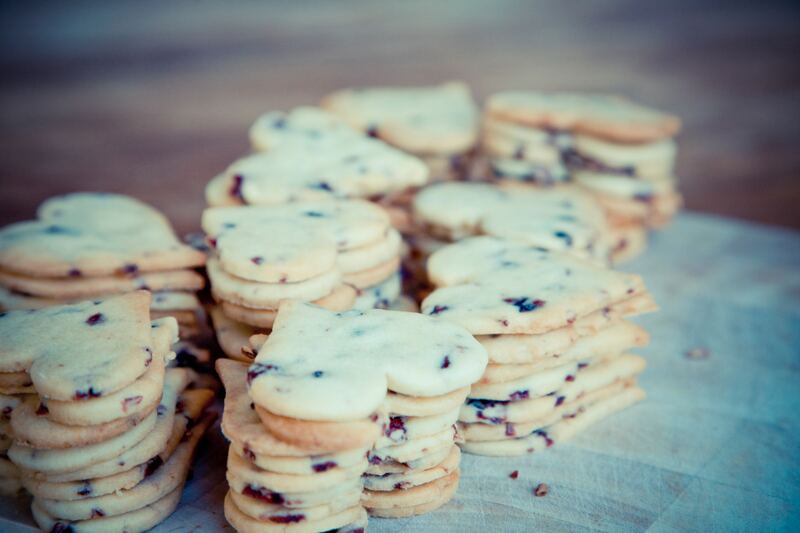 It's important to be sugar-savvy! Think you understand what is and what isn't a free sugar? Why not find out for sure - try our fun quiz and identify the sources of free sugars!